Andrew Robertson has urged Scotland fans to stick with the team ahead of Monday's Euro 2016 qualifier against Germany at Hampden. The Hull City left-back says the players are determined to bounce back from the 1-0 defeat by Georgia. Despite dropping to fourth in Group D, Robertson insists the squad will not dwell on the disappointment in Tbilisi. "We have got such a big game on Monday now and we need the fans and everyone to get behind us," said Robertson. Before facing Georgia, Robertson had said the qualifier had a "must-win" feel in terms of Scotland's hopes of booking a place in next summer's Euro 2016 finals. Following the defeat, Robertson said: "This group is far from over and it would be typical of us to say it - as fans and in the media - but we as a squad are staying together so we need the fans to stay together with us right now." 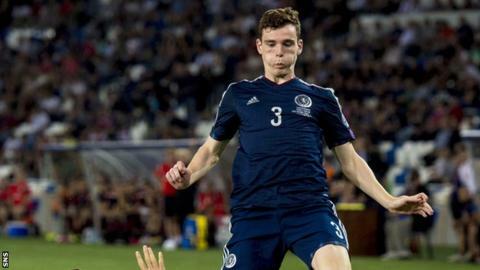 Robertson expressed his gratitude to the Scotland fans that travelled to Tbilisi, and apologised for the result. "We've got to take it on the chin, and obviously the fans will be disappointed but no more disappointed than the boys," he told BBC Scotland. Shaun Maloney, who has just joined his international team-mate at Hull after leaving Major League Soccer side Chicago Fire, admitted the defeat was a setback. "We have to come again on Monday," said Maloney. "Obviously we're going into it as huge underdogs with the way Germany have played over the last year or two. "We'll give it our best shot and see if it's good enough." After facing the Germans, Scotland also have a home game against Poland on October 8, before finishing the group away to Gibraltar. "These are two humungous games and it adds pressure, but this is why teams qualify and teams don't," added Maloney. "I think we have to deal with that pressure and we are very hopeful that we can change the result of this evening on Monday, or on the following gathering."